After the defeat of Napoleon followed by the congress of Vienna in 1815 that determined the shape of the empire, Austro-Hungary experienced a period of rapid growth and technological revolution. Under the strong guiding hand of the new Interior Prince Clemens Von Metternich, a new era of economic expansion and affluence was meticulously circumscribed by a climate of political caution and public censure. Vienna 1820 – 1830 was a time of both opulence and restraint; poised in this contradiction, its primary aesthetic expression is evident in the Biedermeier style. Commonly misunderstood as a cabinetmaker or furniture designer, Mr. “Biedermeier” was in a fact a fictitious character often appearing in political cartoons of the time characterizing the “mind one’s own business” attitude of a generation. 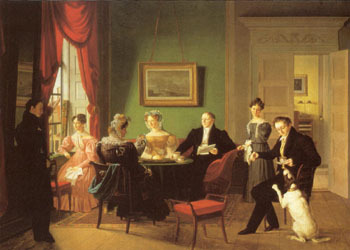 Biedermeier, taken to mean “plain guy” or “every man” was understood in the context of the time to evoke a feeling for the “good old days” and represented the status quo values embraced by the Austrian populace during a period of growth, uncertainty, and potential political instability. A strong economy concurrent with a repressive environment of censure and “political correctness” set the tone for a domestic style – one of elegance and simplicity. An aesthetic emerged that encouraged a focus on the interior of the home as the appropriate arena for freedom of expression. While the genius of the Romantic Movement gripped the hearts and minds of the masses with artists like Beethoven and Goethe, popular culture embraced a vision of an idealized golden age with an almost Olympian reverence for the “great outdoors”. In counterpoint, Vienna ­ the cultural capital of the empire, was a dirty, over-crowded, walled city. The result was the emergence of a style in home décor that was an attempt to bring the great outdoors, with its beautiful woods and its open-air temples, into the livingroom. Iliad specializes in first period Vienna design 1815 -1830. 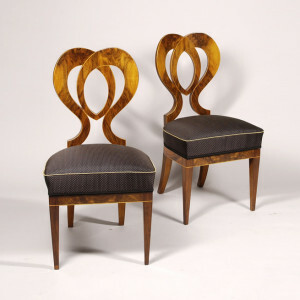 Biedermeier furniture continues to be highly desired for its timeless simplicity and elegance of form and its influence can be seen in much of 20th Century design, from high Art Deco to current Post-Modernism. True Biedermeier is Austro-Hungarian furniture made in the first half of the 19th century, with a specific pedigree associated with the years 1815 – 1830. Since Biedermeier was such a popular style, it had a strong aesthetic impact on Pan – European taste and was frequently copied and revived in different times and different places. 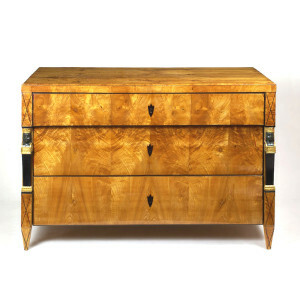 When looking at a piece of furniture, the most important issues to consider are country of origin, when it was made, how well the piece was conceived and executed, and how well it is restored. 1. 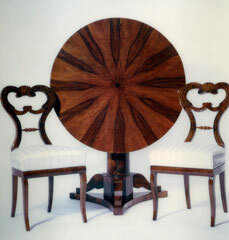 Is the piece Austro-Hungarian or one of the many versions of Northern/ Scandinavian Biedermeier? 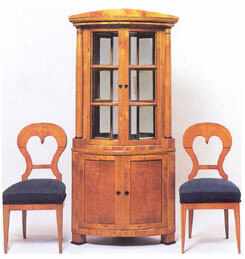 Somewhat similar styles of furniture generically referred to as “Biedermeier” was made throughout the first and second half of the 19th century. 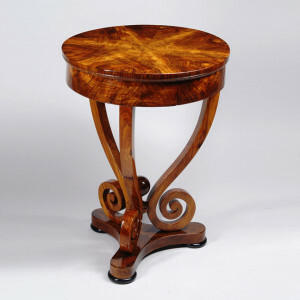 True Biedermeier furniture is region specific and a stylistic product of the socio – political economy of the empire subsequent to the Congress of Vienna in 1815 and the beginning of the industrial revolution. 2. 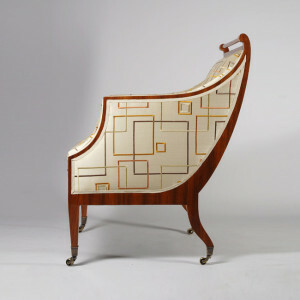 Is it second Biedermeier or Art Deco? Centennial movements (revivals inspired by nostalgia for the past) are common in every important furniture style. Even if the piece is truly Austro-Hungarian, ask if it was made prior to 1835 or after. 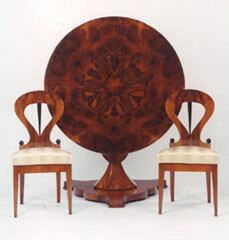 There was a lot of Centennial or Second Biedermeier being produced in this region at the turn of the 20th century. To many, this may be an alternative to filling out a collection however, these pieces do not have the same intrinsic value. 3. How unusual or rare is the form? How exotic is the veneer? 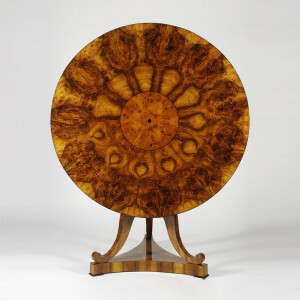 In some pieces of Biedermeier furniture, you have examples of beautiful form but average veneer and in some pieces you have examples of beautiful veneer and average form. Premium value is set when distinctive form coincides with exquisite veneer. The value of a piece of Biedermeier is determined on a sliding scale depending on the harmonious convergence of these two critical factors. 4. Look at the conservation and restoration of the piece. How much has been added or subtracted from the form and the original veneer? A very important matter is the material used as a finish. Is it shellac or Lacquer? Shellac (French or German polish) is the proper non-synthetic finish regarded as Museum standard in Vienna and the proper original finish for Biedermeier. Synthetic sprayed lacquer is a less expensive alternative to the higher cost and necessary expertise of a proper polish. Lacquer generally has a somewhat cloudy, less translucentent quality to it and tends to alter the natural color of wood veneers. Furthermore, since it is uniformly sprayed onto a surface, it does not adapt well to the supple contours of age that add to the beauty of the furniture. If it is truly a shellac polish, look for the thickness of the finished surface. A proper polish can take a hundred or more hours of rubbing to build up thickness and luster. Be sure you can not see any wood pores coming through the surface of the piece. A good finish should look like glass.